This blog is a gift to my wife, Renee, and my children, Adele, Athan, Audrey, Anne, and Amelia. Read Further to See How I Can Afford This Thing! In my last post, I talked about the family and what we were up to in 2018. Today's post is about money. As most of you will agree, raising a family requires a lot of resources, and money is definitely one of the important ones. So, I'm going to tell you about one of the things I did on the money front. Owning a Tesla for Free? Back in late 2017, I read an article on Business Insider about a couple using a car-sharing app called Turo, to pay for their two Teslas. This got me interested as I had reserved a Model 3 back in 2016. At that time, Tesla advertised that it was going to be a $35,000 (USD) car. With the savings in gas on my daily commute of 100 km+, that would not be such a heavy burden. However, as 2017 progressed, it became apparent that the $35,000 car wasn't going to be in sight for quite some time (it's still not here yet). So, having read this article, I have renewed hope that I was somehow going to be able to make it work. 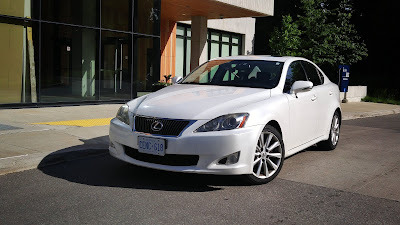 Soon after, I replaced my aging 12-year old Prius with a 6-year old Lexus CT. Since I didn't really need the car on weekends (we went everywhere in our Odyssey), I would put that car on Turo on the weekends as well. And soon after that, Tesla told me that I was then able to place the order for the Model 3. There was really no choice in trim level or options at that point; only the long range battery with RWD and premium package was available. The car with destination fees and taxes would be more than $80,000! Up to that point in time, I had never spent more than $25,000 on a car. That was a great departure from my usual frugal (...more like stingy...) self. Seeing that the Liberal government had a fairly good chance of losing the election, I bit the bullet and ordered the Model 3, in hopes that it would arrive in time for me to take advantage of the $14,000 rebate. In the end, I was able to submit my rebate application before Doug Ford ended it. It still feels somewhat unreal that I now drive such an expensive car! Thus far, the Model 3 has been able to pay for its monthly car payments. So, Turo is kind of the real deal. You can say it's the AirBnb for cars. Some of you are wondering how I could even let someone else drive the Tesla without worrying to death...to which I respond that I would rather own a Tesla and let someone else drive it once in a while than not owning one at all. I think some of you may be intrigued at this point and would like to know more. So, I will give you some details. With the Accord and CT, I have been able to net $300-400 per month. This would be after all costs including insurance, depreciation, interests, maintenance, repairs, etc. etc. The daily rate ranges from $28 to $40 (higher in summer months) and utilization is probably around 25 days a month, +/- a couple of days. There are also extras like delivery, cleaning charges, late fees, etc. that boost my revenue. Turo takes 25% of that, but provides full insurance coverage when the car is rented out. So, if a guest crashes the car, it would not hit my personal insurance policy, and there is no deductible for me. I get paid fully on the damages or value of the car if it is totaled. This is also fully legit with my insurance company, The Personal. Turo, in fact, partners with a bunch of insurance companies, including Belair Direct, Intact, Desjardins, etc. As with any venture, there is no free lunch. I do have to put in some work. Most of it is cleaning the car after each rental, and occasionally, delivering and picking up from the airport. It is, however, much better than driving Uber, in terms of time investment. I would say I spend about 4 to 8 hours a week managing 4 cars right now. Some have asked me if I were spending money paying for cars, why not buy a house and rent it out. Renting out cars and renting out real property are two different business models. Renting out a house is usually a cash flow negative business (i.e. the rent you receive will not be able to pay for all your expenses + mortgage), but you are hoping for the asset to appreciate. That's where you would make your money. Renting out a car has to be a cash flow positive business, because your asset is a depreciating asset. If you're not cash flow positive, then forget about it. As I mentioned at the start, I need money to raise a family (i.e. cash flow), which is why Turo is my kind of business. As a host, I can certainly see how Turo is indeed the AirBnb for cars. Like AirBnb, it provides such a good experience for both the host and the guest. Like many people, I've rented cars from Avis, Budget, Enterprise, etc. and the experience pretty much is always sub-par. First, you book a class of the car you want, but never know what car you will actually get. Then, you are greeted by an expressionless customer service rep at the counter. The paperwork usually takes 15 minutes, most of which consists of hard selling extras like insurance, prepaid gas, damage waivers and the like, before you finally get assigned a bland car that excites exactly no one. Contrast that with Turo, there is literally no paperwork required and you can pick the exact car you want. The review system gives you peace of mind that the host you're dealing with will likely provide you an excellent experience. Lastly, Turo hosts will often deliver to curbside at the airport, just like how your friend would pick you up, except they leave you with their beautiful car. When I was in Florida, I used Turo and preferred it over the traditional car rental places. So, the next time you need to rent a car, take a look at Turo and see if it meets your needs. In fact, let me shamelessly provide you my referral link! https://turo.com/c/felixw41 If you sign up using this link and rent a car, both you and I get $25 USD in Turo credit! Also, check out my fleet; if you have guests coming into town, I'd be glad to help if they needed a car! © Felix Wong. Powered by Blogger. Thank YOU!! Keep It Coming! It's Our Last Day! Why I Run (and Why You Should Give Us Some Money)! I Look Like a Monk!